The Decline of the Centre Left in Europe? Much has been made in the media over the last year about the decline of traditional mainstream left-wing parties across Western Europe. Articles in the Economist and the New Statesman have outlined how the traditional centre left are under attack, alongside insurgent parties from the extreme left and right alike who are presenting contrasting ideological programmes. Recent election results across Europe encapsulate the downward trend of leftist parties. In Greece, the extreme left-wing party Syriza emerged from the politics of austerity amidst the worsening economic situation to become the governing party in January 2015 and were recently re-elected in September 2015. Consequently, the mainstream left-wing party PASOK nearly suffered an electoral wipe out as a result. Similarly, social democratic parties in Spain have lost ground to the insurgent extreme left-wing party Podemos. However, Podemos did not do as well as expected in the national parliamentary elections held in December 2015. The UK Labour Party also suffered a dismal defeat at the hands of the Conservative Party at the 2015 General Election and with the party appointing far left MP Jeremy Corbyn last summer have seen their vote decline in national opinion polls. France further typifies the problem that contemporary left-wing parties face, with François Hollande and the incumbent Socialist Party currently polling at record lows in the polls. The centre right party Les Républicains (LR) have sought to capture the immigration and nationalism issue away from the French National Front (FN) with varying results. Central-Eastern Europe: Rise of the Right? A similar story is portrayed in Central-Eastern Europe, with right-wing politics dominating since the 2010 national parliamentary election in Hungary and the shift to the right in the 2015 Polish elections. Although a left-wing alliance was formed in Hungary between leftist parties, the left failed to make significant inroads in the 2014 national parliamentary election. The incumbent governing party Fidesz further consolidated its power at the 2014 national parliamentary election , but still faces a credible electoral threat from the extreme right-wing party Jobbik. Fidesz is clearly benefiting from the ongoing Migration crisis and Prime Minister Viktor Orbán is making political hay from the current situation. Scandinavia has also seen a similar picture with the rise of insurgent centre right parties in Norway and Denmark. Anti-immigrant parties in Finland and Denmark have also made significant inroads into the political system. Outliers remain of course, with social democratic parties in Sweden consolidating their electoral base and Matteo Renzi’s social democratic party in Italy remaining the largest party in national parliamentary and European elections alike. As an Economist article touched upon last year, a number of shortcomings have arguably affected social democratic parties across Europe. Three explanations have largely been given for this in recent times. The first explanation has centred on the fact that a large majority of centre left incumbents were in power at the start of the 2007/08 economic crisis and may explain in part why there has seemingly been a decline in social democratic parties across Europe since this period. Secondly, it has been argued that centre left parties have lacked credibility in the context of the economic crisis that hit the Eurozone, with voters conceivably favouring policies of austerity over Keynesian economic management. In turn, the policies of austerity have tended to be adopted by centre right parties. The third explanation centres around the notion that insurgent extreme left and extreme right-wing parties are presenting a new brand of politics that is winning over the electorate. The Economist article argued that anti-immigrant sentiment has proved to be dangerous for centre left parties ‘caught between the embrace of diversity and the protectionist instincts of workers’. In turn, the nationalist card often used by parties of the extreme right has been adopted by populist centre right party families in France and Hungary. This has inevitably proved to be an electorally successful party strategy. Similar statistical findings for this downward trend in aggregate electoral support for centre left parties are found in this article below in Figure 1.1. Figure 1.1 depicts the change in party performance for different party families across 24 European countries before and during the onset of the economic crisis. Data from national parliamentary elections is taken from the national parliamentary elections prior to the economic crisis to the following election for different party families on the left and right alike. Positive scores on the change in party performance variable implies that a party has increased its electoral performance in national parliamentary elections from the election prior to the economic crisis to the following election at the start of the crisis. Negative scores on the change in party performance score implies that a party has seen a decrease in its electoral performance from the last election. 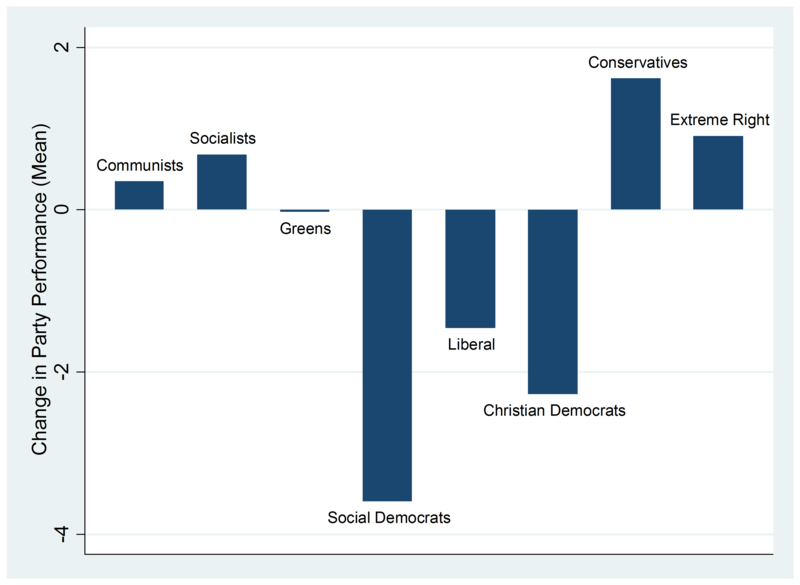 The scatterplot below goes some way to suggest that parties on the left were punished severely during the economic crisis. Social Democrats appear to have born the largest brunt in the context of the economic crisis, with a number of parties losing out electorally. The bar chart shows that political parties on the centre right that comprise the Christian Democrats and the Conservatives appear to perform electorally better, achieving a higher percentage change. Varying results are also found for nationalist or parties of the extreme right. Figure 1.2 below depicts the average change in electoral performance for different parties in the context of the economic crisis. The results suggest that Conservative and Nationalist parties performed the best electorally. Clearly the economic crisis that began in 2008 and swept its way across EU member states did not lead to a systematic rise for extreme right-wing parties. Instead, wider patterns of electoral volatility are observed. Nonetheless, Social Democrats electoral performance declined considerably again. At first sight, the results seem to suggest that centrists performed the worst, with an average decrease of -6.80 in their aggregate electoral share. However, caution must be applied to this result, with only three political parties being categorized as a centrist party in the national parliamentary elections results dataset. This may have had an effect in skewing this result. Therefore, the data in this article suggest that traditional mainstream social democratic parties need to go back to the basics and identify a core strategy to reverse the current tide towards insurgent parties on the left and right alike that has swept its way across European shores of late. Arguably, traditional left-wing parties across Europe are in a state of flux, with contemporary parties of the right on the ascendancy. To talk of a systematic decline in mainstream left parties is however a tad premature. Evidently, these parties must go back to the drawing board, rebrand their party strategies and win back their core voters.